Once you make your own peanut butter you may well wonder why you've been buying it all these years. Seriously. It is literally just putting peanuts in a food processor for 2 to 3 minutes. Even with scraping it out of the processor and washing up, the whole thing takes less than 10 minutes. An exact recipe, such as it is, plus a whole lot of variations for flavored peanut butters and other nut butters that are almost just as easy to make are below. You'll see the recipe calls for unsalted peanuts and then has you add salt. This is because while peanut butter needs a bit of salt to bring out that great nutty flavor, the amount of salt in salted nuts tends to be WAY too much in peanut butter. Put the peanuts and salt in a food processor. Whirl until they become peanut butter, at least 2, and up to 3 minutes. At first the peanuts will be chopped, then clump together into a ball, and finally break apart into a smooth nut butter. If you want a thinner peanut butter, add the optional peanut oil and whirl to combine. Taste and add more salt, if you like. Transfer the peanut butter to a jar or other container and cover. If your homemade nut butter separates—oil rises to the top—all you need to do is stir that oil back in. A lack of artificial stabilizers lets the solids and oil separate; in no way does this signal the nut butter "going bad." When nut butters go bad, you can smell it—they take on a rancid scent. Fresh nut butter will keep up to several weeks at room temperature (remember, it's just nuts!) or up to a year in the fridge. Chocolate Peanut Butter is sort of like a healthier, more delicious Nutella. Smear it on bread or spoon it onto ice cream. Melt 1/2 cup chopped dark chocolate or chocolate chips, let cool to room temperature, and whirl into the peanut butter. 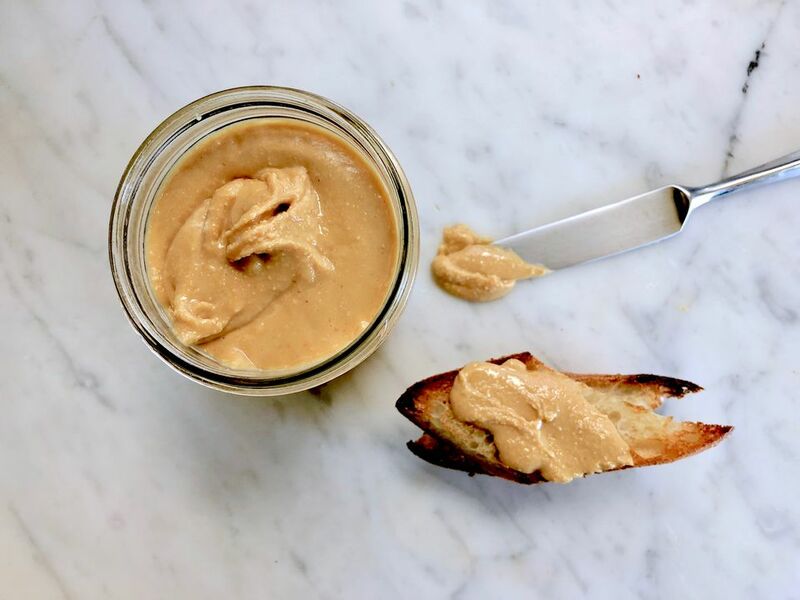 Honey Peanut Butter is a sweet treat that is utterly perfect for smearing on toast at breakfast or as a snack. Add 3 tablespoons of honey to the mix for a classic flavor combination in a single jar. Maple Peanut Butter gets an earthy sweetness from real maple syrup—perfect for pancakes. Start with adding 3 tablespoons of pure maple syrup, increasing the amount until the result is as sweet as you like. Spicy Peanut Butter is for those who love the savory side of nut butters and want to experiment with unique sandwiches and kicky breakfasts. Add 1 tablespoon chile oil and 1/4 teaspoon cayenne to the nuts when you process them. Taste and add more until it's as spicy as you like. Almond Butter is all the rage for a reason—it tastes great and has an admirable nutritional profile. It is counterintuitive and the opposite of other nuts, but unroasted almonds make a more fully flavored and almond-like almond butter. Use blanched almonds (with the skins removed) for a more mellow effect. Cashew Butter is remarkably rich and creamy. Finding unsalted roasted cashews can be a challenge, but it's worth it. Walnut Butter is a bit trickier only because walnut skins are pretty darn bitter and they aren't super easy to get off. Luckily, there is a way. Blanch the walnuts (dunk for just a moment in boiling water, drain, and dry) and rub them to remove their skins. Then toast them, let them cool, and proceed with whirling them into butter.